Providing the satellite radio installation Atlanta has trusted for 15 years, we at Drops Mobile Electronics have the knowledge and experience necessary to ensure that your satellite radio receiver is installed correctly the first time. Whether you have your own satellite radio receiver, or you wish to choose from one of our trusted brands, we will work with you to ensure that you understand how to get the best entertainment experience. Satellite radio has several benefits, one of its greatest advantages being that it provides a listening experience free from commercials for many stations. It offers a wide selection of music, comedy, sports, religion, and talk radio options to accommodate all preferences. Additionally, you will never have to worry about static. No matter where you are driving or how far you are going, you can enjoy crystal-clear sound for your entire trip. At Drops Mobile Electronics, we have experience in installing a variety of different satellite radios, including Sirius, and XM Radio. Whether you are interested in installing a built-in satellite radio tuner system, or you are integrating a tuner with your vehicle’s existing audio system, we have the skill necessary to complete the job efficiently. Because we are a mobile company, you never have to worry about driving to a shop and waiting for service. We provide outstanding customer service, when and where it is most convenient for you. 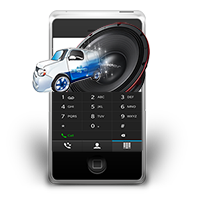 Drops Mobile Electronics has been providing Atlanta satellite radio installation services for 15 years. We have experience in installing satellite radio in cars, RVs, semi-trucks, tractor trailers and fleet vehicles. Our experienced professionals can help you select from one of our models, or we can assist you by installing your own pre-purchased model. Either way, we will work with you to ensure that you understand how to get the most from your new system. Bluetooth? Remote Starter? Touchscreen Radio? Ipod? Get these sweet products installed with confidence! Drops Mobile Featured in Mobile Electronics Magazine!